Cyprus has flourished in recent years as both a business and travel destination, inviting tourists and innovative businesses alike to explore its pristine shores. For startups, wealthy individuals and holiday home seekers, this presents a unique opportunity to invest in prime Cypriot apartments. The island’s popularity for one-man startups and wealthy investors makes apartments an ideal, small scale and therefore sensible investment for yourself or for the future. These smaller scale investments represent a perfect opportunity to dip into one of Europe’s leading lights, and to experience the beauty and tranquility of the island for yourself. 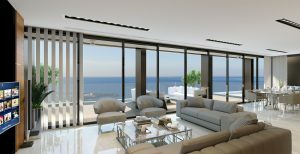 Read below to for a few examples of the various apartments in Cyprus that are currently available, from the city of Limassol to the island’s more isolated and tranquil towns and villages. Beauty, history and culture: the town of Pafos has it all. The European Capital of Culture for 2017 is also the birthplace of Aphrodite, and still sports ruins and relics dedicated to the Greek goddess of love. This jewel in Cyprus’ crown sports Blue Flag beaches, renowned nightlife, shopping malls and resorts, and boasts an incredible 340 days of sunshine each year. As a fast-growing hub for both tourism and other businesses in Cyprus, an apartment in Pafos is an ideal investment, whether you’re a small family, couple or individual investor. Here are just a couple examples of the kinds of apartments available in this exceptional town. Magnolia Court is primely positioned on the west coast of Pafos, just above the harbour. The spacious apartments are just 15 minutes from Pafos International Airport, and only 5 minutes from the town’s large shopping malls and harbour-front activities. With three bedrooms and the renowned International School of Paphos just 8 minutes away, it’s also perfect for families. The spacious, luxurious interiors are hand-picked by professional interior designers, with a range of options for every taste and budget. Amenities include a large communal swimming pool, communal fitness area, and a paddling pool and playground for children, while all apartment blocks feature lift access. Apartment sizes range from 116m² to 177m², with prices starting at just EUR309,700 plus VAT. These beautiful traditional apartments all offer seaviews, and all benefit from a prime central location. Situated just three minutes from the Kings Avenue Mall and five minutes from the harbour, the Pearl Park Residences allow occupants to experience everything Pafos has to offer, while also providing many amenities for daily life. Balconies offer panoramic views of the harbour, town and countryside, while interiors are stylish and spacious. The International School of Paphos is just 7 minutes away, while a private pool and gym for residents are right on your doorstep. This incredible package is rounded off with a large green park parallel to the residence, and the picturesque St George Chapel. The apartments range from 82m² to 174m² in size, and cost upwards of EUR302,000 plus VAT. The second largest city in Cyprus is fast becoming its most popular destination, both for visitors and residents. Limassol was recently ranked as the world’s 3rd best up-and-coming destination by Tripadvisor, and boasts one of the highest standards of living in the world. With a bustling metropolis, beautiful sights and exquisite food, it’s not hard to see why. If you’re looking to move with family to this incredible Mediterranean city or simply investing for the future, look no further than this jewel in Cyprus’ crown. 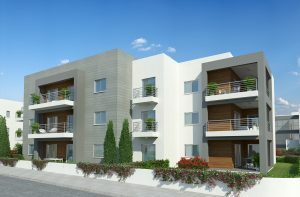 Here are a couple of examples of the incredible apartments available in Limassol. The striking Spectrum apartments are the height of luxury, and the apex of contemporary design. Developed by award-winning architects, the facade is striking without overpowering the surrounding buildings. Primely positioned on the waterfront near the private St Raphael Marina, and close to the city’s many attractions, Spectrum is the perfect backdrop for both business and pleasure. All of the apartments at the Spectrum have been specially designed to facilitate flexible modern living. The spaces enjoy bountiful natural light, and are fitted with the latest technologies and highest quality finishes. A spacious entrance lobby is perfect for business engagements, while the large private pool is the perfect way to cool off. Apartment sizes range from 160m² to 213m², and start at a suitably exclusive EUR2,100,000 plus VAT.